Severe and very severe hypertriglyceridemia increase the risk for pancreatitis, whereas mild or moderate hypertriglyceridemia may be a risk factor for cardiovascular disease. Individuals found to have any elevation of fasting triglycerides should be evaluated for secondary causes of hyperlipidemia including endocrine conditions and medications. Patients with primary hypertriglyceridemia must be assessed for other cardiovascular risk factors, such as central obesity, hypertension, abnormalities of glucose metabolism, and liver dysfunction. The aim of this study was to develop clinical practice guidelines on hypertriglyceridemia. The diagnosis of hypertriglyceridemia should be based on fasting levels, that mild and moderate hypertriglyceridemia (triglycerides of 150–999 mg/dl) be diagnosed to aid in the evaluation of cardiovascular risk, and that severe and very severe hypertriglyceridemia (triglycerides of >1000 mg/dl) be considered a risk for pancreatitis. The patients with hypertriglyceridemia must be evaluated for secondary causes of hyperlipidemia and that subjects with primary hypertriglyceridemia be evaluated for family history of dyslipidemia and cardiovascular disease. The treatment goal in patients with moderate hypertriglyceridemia should be a non-high-density lipoprotein cholesterol level in agreement with National Cholesterol Education Program Adult Treatment Panel guidelines. The initial treatment should be lifestyle therapy; a combination of diet modification, physical activity and drug therapy may also be considered. In patients with severe or very severe hypertriglyceridemia, a fibrate can be used as a first-line agent for reduction of triglycerides in patients at risk for triglyceride-induced pancreatitis. Three drug classes (fibrates, niacin, n-3 fatty acids) alone or in combination with statins may be considered as treatment options in patients with moderate to severe triglyceride levels. Statins are not be used as monotherapy for severe or very severe hypertriglyceridemia. However, statins may be useful for the treatment of moderate hypertriglyceridemia when indicated to modify cardiovascular risk. The Sbarro Health Research Organization, in collaboration with the Consulate General of Italy in Philadelphia will sponsor a symposium on the Mediterranean Diet and Human Health on October 19, 2018 at Temple University in Philadelphia, PA. This symposium will discuss recent finding concerning the health benefits derived from a Mediterranean-style diet discussed by the leaders in this field of research. Prof. Antonino De Lorenzo, MD, PhD. Prof. Antonio Giordano, MD, PhD. Prof. Antonio Giordano MD, PhD. 12.00 The Italian Mediterranean Diet as a Model of Identity of a People with a Universal Good to Safeguard Health? Dr. Iris Maria Forte, PhD. 2:30 Mediterranean Diet, Intangible Heritage and Sustainable Tourism? Coordinator of the Symposium, Dr. Alessandra Moia, PhD. Professor of Molecular Biology at Temple University in Philadelphia, PA where he is also Director of the Sbarro Institute for Cancer Research and Molecular Medicine. He is also Professor of Pathology at the University of Siena, Italy. He has published over 500 articles, received over 40 awards for his contributions to cancer research and is the holder of 17 patents. Full Professor of Human Nutrition and Director of the Specialization School in Food Science at the University of Rome “Tor Vergata”. He is the Coordinator of the Specialization Schools in Food Science at the National University Council and Coordinator of the PhD. School of “Applied Medical-Surgical Sciences” Director of UOSD “Service of Clinical Nutrition, Parenteral Therapy and Anorexia”. He also serves as President of “Istituto Nazionale per la Dieta Mediterranea e la Nutrigenomica”. Iris Maria Forte is an oncology researcher of INT G. Pascale Foundation of Naples, Italy. She majored in Medical Biotechnology at the “Federico II” University of Naples, earned a PhD. in “Oncology and Genetics” at the University of Siena in 2012 and a Master of II level in “Environment and Cancer” in 2014. Iris Maria Forte has worked with Antonio Giordano’s group since 2008 and her research interests include both molecular and translational cancer research. She published 21 articles mostly focused in understanding the molecular basis of human cancer. She worked on different kinds of human solid tumors but her research principally focused on pleural mesothelioma and on cell cycle deregulation in cancer. Professor in the Department of Nutrition and Food Studies. He has a Doctorate in Agricultural Sciences (Dr.sc.agr.) from Hohenheim University, Stuttgart (Germany), MA in Political Sciences from the Istituto Universitario Orientale, Naples (Italy), BA/MA in Modern Foreign Languages and Literature from the Università La Sapienza, Rome (Italy). His research explores the intersections among food, media, and politics. His most recent projects focus on Food Design and the synergies between Food Studies and design. Dietetic Internship Director and a Clinical Associate Professor in the department. She has interests in dietetic education, weight and behavior management, and problem-based learning. She also is a private practice nutritionist with a focus on weight management. She serves as co-director of the Food, Nutrition and Culture program in Florence Italy, the New York State Dietetic Association and the Greater New York Dietetic Association (past president and treasurer). Director of Demographic Studies for The John D. Calandra Italian American Institute, Queens College, City University of New York. He has conducted social science research on Italian Americans. His research has included the educational and occupational achievements; Italian language studies at the elementary and secondary levels, high school non-completion rates; negative media portrayals of ethnic populations including migration studies and global diaspora. Agricultural entrepreneur, Manager of the Italian Consortium for Biogas (CIB) and delegate for the Bioeconomy National Department of Confagricoltura. He developed A.R.T.E based on a model of agricultural circular economy, beginning and ending in the ground. He constructed the first biogas plant in the territory creating a new way to make agriculture, investing in research and development, experimentation and most of all, in people. In a few short years, he succeeded to close the production chain producing goods characterized by their high quality and usage of renewable energy. Vice-President for Institutional and International Relations of the Istituto Nazionale per la Dieta Mediterranea e la Nutrigenomica (I.N.D.I.M.). Has managed relations with the academic institutions to increase awareness and develops projects for the diffusion of the Mediterranean Diet. She served as Director of Finance for the National Institute of Nutrition, for the Ministry of Agriculture and Forestry. PRALUENT is a PCSK9 (Proprotein Convertase Subtilisin/Kexin Type 9) inhibitor antibody indicated as adjunct to diet and maximally tolerated statin therapy for the treatment of adults with heterozygous familial hypercholesterolemia or clinical atherosclerotic cardiovascular disease, who require additional lowering of LDL-C. The recommended starting dose of PRALUENT is 75 mg administered subcutaneously once every 2 weeks, since the majority of patients achieve sufficient LDL-C reduction with this dosage. If the LDL-C response is inadequate, the dosage may be increased to the maximum dosage of 150 mg administered every 2 weeks. Measure LDL-C levels within 4 to 8 weeks of initiating or titrating PRALUENT to assess response and adjust the dose, if needed. PRALUENT efficacy was investigated in 5 double-blind, placebo-controlled trials with 3499 patients enrolled: 36% with HeFH and 54% non-FH with clinical ASCVD. Clinical ASCVD is defined in the ACC/AHA guidelines2 as acute coronary syndromes or a history of any of the following: myocardial infarction, stable or unstable angina, coronary or other arterial revascularization, transient ischemic attack or stroke, or peripheral arterial disease presumed to be of atherosclerotic origin. PRALUENT is contraindicated in patients with a history of a serious hypersensitivity reaction to PRALUENT. Reactions have included hypersensitivity vasculitis and hypersensitivity reactions requiring hospitalization. Hypersensitivity reactions (e.g., pruritus, rash, urticaria), including some serious events (e.g., hypersensitivity vasculitis and hypersensitivity reactions requiring hospitalization), have been reported with PRALUENT treatment. If signs or symptoms of serious allergic reactions occur, discontinue treatment with PRALUENT, treat according to the standard of care, and monitor until signs and symptoms resolve. The most commonly occurring adverse reactions (≥5% of patients treated with PRALUENT and occurring more frequently than with placebo) are nasopharyngitis, injection site reactions, and influenza. Local injection site reactions including erythema/redness, itching, swelling, and pain/tenderness were reported more frequently in patients treated with PRALUENT (7.2% versus 5.1% for PRALUENT and placebo, respectively). Few patients discontinued treatment because of these reactions (0.2% versus 0.4% for PRALUENT and placebo, respectively), but patients receiving PRALUENT had a greater number of injection site reactions, had more reports of associated symptoms, and had reactions of longer average duration than patients receiving placebo. Neurocognitive events were reported in 0.8% of patients treated with PRALUENT and 0.7% of patients treated with placebo. Confusion or memory impairment were reported more frequently by those treated with PRALUENT (0.2% for each) than in those treated with placebo (<0.1% for each). Liver-related disorders (primarily related to abnormalities in liver enzymes) were reported in 2.5% of patients treated with PRALUENT and 1.8% of patients treated with placebo, leading to treatment discontinuation in 0.4% and 0.2% of patients, respectively. Increases in serum transaminases to greater than 3 times the upper limit of normal occurred in 1.7% of patients treated with PRALUENT and 1.4% of patients treated with placebo. The most common adverse reactions leading to treatment discontinuation in patients treated with PRALUENT were allergic reactions (0.6% versus 0.2% for PRALUENT and placebo, respectively) and elevated liver enzymes (0.3% versus <0.1%). PRALUENT is a human monoclonal antibody. As with all therapeutic proteins, there is a potential for immunogenicity with PRALUENT. The presence of elevated cardiac troponin T in the blood was found to be an early independent predictor of end-stage renal disease and death in both African Americans and whites with hypertension or a family history of high blood pressure, researchers said. Cardiac troponin T (cTnT) testing is routinely used to diagnose myocardial infarction or assess heart muscle damage in this setting, and several studies suggest that minimally elevated cTnT levels are associated with greater all-cause death risk in older people and in patients with chronic kidney failure. The newly published study is the first to suggest a role for cTnT as a predictor of end-stage renal disease in patients with hypertension, nephrologistLaTonya Hickson, MD, and colleagues from the Mayo Clinic in Rochester, Minn., wrote in the journal Mayo Clinic Proceedings. At 10-year follow-up, the estimated cumulative incidence of end-stage renal disease (ESRD) was 27.4% among study participants with abnormal cTnT levels (0.01 ng/mL or higher), compared to 1.3% among participants with lower cTnT levels. “As patient populations grow older with increasing multimorbidity, identifying those at the highest risk of death or end-stage renal disease could improve patient management strategies,” the researchers wrote. Several other recent studies have shown that a highly sensitive assay for cTnT, not yet clinically available in the U.S., can predict death and cardiovascular disease in community-dwelling older people. For example, an analysis of 4,221 older people participating in the NHLBI’s Cardiovascular Health Study found that elevated levels of cTnT measured with such an assay were associated with a higher risk for cardiovascular death and heart failureindependent of other biomarkers. Hickson said the idea for examining cTnT as a potential predictor of ESRD stemmed from earlier research by the Mayo team showing an increased risk for death associated with the highest cTnT levels among patients with kidney failure undergoing transplants. “We now use this marker at Mayo to assess these patients,” she said. The study included just over 3,000 participants in the National Heart, Lung, and Blood Institute’s GENOA study, originally designed to identify genetic determinants of hypertension in various racial groups. Just under half (45%) of the participants were white residents of the Rochester, Minn., area and the rest were African American residents of Jackson, Miss. At baseline, a total of 71.3% were hypertensive and 32.5% had evidence of abnormal kidney function (glomerular filtration rate of less than 60 mL/min per 1.73 m2). About half (51.6%) had high sensitivity C-reactive protein levels greater than 3 mg/L. Just 2.2% (66 of 3,050) had abnormal cTnT levels of 0.01 ng/mL or higher. In addition to the 20-fold increase seen in risk for ESRD among those with abnormal cTnT, their estimated cumulative incidence of death at 10 years was 47%, compared to 7.3% among those with normal cTnT. “Abnormal cTnT levels were strongly associated with ESRD and death,” the researchers wrote. “This effect was attenuated but was still highly significant after adjustment for demographic characteristics, estimated glomerular filtration rate, and traditional risk factors for ESRD,” they wrote, with an adjusted hazard ratio of 2.81 (95% CI 1.3-5.9) for ESRD and 3.46 (95% CI 2.3-5.1) for death. They also noted that limiting the cohort to people with hypertension or belonging to hypertensive families may impact the study’s generalizability. The researchers concluded that as patient populations grow older and develop more health issues, identifying those with the greatest risk for ESRD will become more important. Funding for this research was provided by the Mayo Foundation, the National Institues of Health, and a Mary Kathryn and Michael B. Panitch Career Development Award. Co-author Allan S. Jaffe reported receiving consulting fees from “most of the major diagnostic companies.” The other researchers reported no relevant relationships with industry. The previous discussion concerned genomics, metabolomics, and cancer. The discussion that follows is concerned with the expanding filed of proteomics, which has implication for disease discovery, pharmaceutical targeting, and diagnostics. Marc Vidal, Daniel W Chan, Mark Gerstein, Matthias Mann, Gilbert S Omenn, et al. A National Institutes of Health (NIH) workshop was convened in Bethesda, MD on September 26–27, 2011, with representative scientific leaders in the field of proteomics and its applications to clinical settings. The main purpose of this workshop was to articulate ways in which the biomedical research community can capitalize on recent technology advances and synergize with ongoing efforts to advance the field of human proteomics. This executive summary and the following full report describe the main discussions and outcomes of the workshop. Amos Bairoch has always been fascinated by computer science, genetics and biochemistry. His fi rst project, as a PhD student, was the development of PC/Gene, a MS-DOS based software package for the analysis of protein and nucleotide sequences. While working on this project, he realized that there was no single resource for protein sequences, and started to develop the first annotated protein sequence database, which became Swiss-Prot and was first released in July 1986. In 1988, he created PROSITE, a database of protein families and domains, and a little later ENZYME, an enzyme nomenclature database. Amos Bairoch led the Swiss-Prot group from its creation in 1988 until 2009. During this period, Swiss-Prot became the primary protein sequence resource in the world and has been a key research instrument for both bioinformaticians and laboratory-based scientists, particularly in the field of proteomics. specifically dedicated to human proteins.neXtProt has been chosen as the reference protein database for the HUPO Human Proteome Projects. For his major contributions in the field of proteomic databases, Amos Bairoch received the Friedrich Miescher Award from the Swiss Society of Biochemistry in 1993, the Helmut Horten Foundation Incentive Award in 1995, the Pehr Edman award and the European Latsis Prize in 2004, the Otto Naegeli prize in 2010, and the HUPO Distinguished Achievement Award in Proteomic Sciences in 2011. The National Heart, Lung, and Blood Institute (NHLBI) Clinical Proteomics Working Group was charged with identifying opportunities and challenges in clinical proteomics and using these as a basis for recommendations aimed at directly improving patient care. The group included representatives of clinical and translational research, proteomic technologies, laboratory medicine, bioinformatics, and 2 of the NHLBI Proteomics Centers, which form part of a program focused on innovative technology development. This report represents the results from a one-and-a-half-day meeting on May 8 and 9, 2003. For the purposes of this report, clinical proteomics is defined as the systematic, comprehensive, large-scale identification of protein patterns (“fingerprints”) of disease and the application of this knowledge to improve patient care and public health through better assessment of disease susceptibility, prevention of disease, selection of therapy for the individual, and monitoring of treatment response. The retention of proatherogenic low-density lipoprotein (LDL) particles on the subendothelial extracellular matrix (ECM) is a hallmark of atherosclerosis. Apolipoprotein B (apoB)-containing lipoprotein particles are trapped in the arterial intima by proteoglycans in atherosclerosis-prone areas and eventually become modified, commonly by aggregation and oxidation. The initial accumulation of proatherogenic lipoproteins initiates an inflammatory response, which results in the release of proteolytic enzymes and induces the dedifferentiation of vascular smooth muscle cells (SMCs) resulting in alterations of their matrix producing properties. The precise mechanisms responsible for the accumulation of certain matrix components and subsequent lipoprotein retention on the vessel wall are not fully elucidated. Undoubtedly, ECM remodeling contributes to the formation of atherosclerotic lesions and the lipid composition of apolipoproteins influences their binding properties to the matrix. An unbiased discovery approach, which is not limited to known molecules of presumed importance, will be invaluable for the identification of novel, previously unknown mediators of disease. Although descriptive, the detailed examination of atherosclerotic plaques using advanced proteomics and lipidomics techniques can generate novel insights and form the basis for further mechanistic investigations. Stable and robust nanoflow LC/MS is still a challenge in proteomics analysis. The Bruker CaptiveSpray source is a revolutionary ion source with a patented design that provides provides easy operation just as simple normal flow electrospray. CaptiveSpray delivers nanospray sensitivity, resists plugging, and provides reproducible uninterrupted flow for even the most complex proteomics samples. CaptiveSpray nanoBooster brings your MS to the next performance level and provides even higher flexibility. 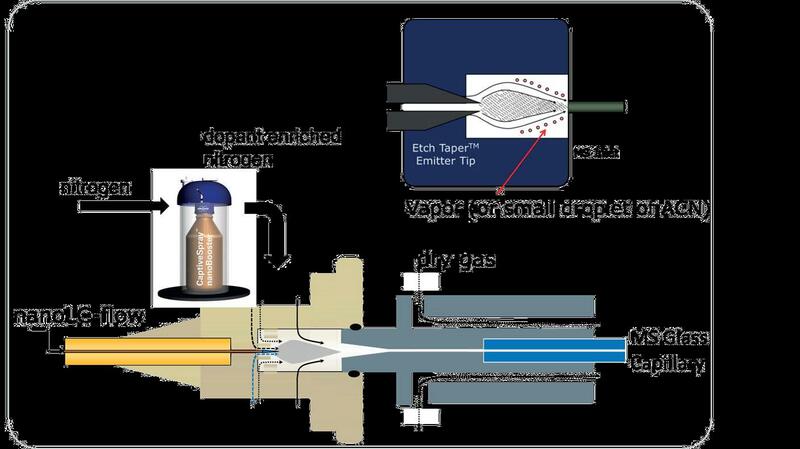 CaptiveSpray provides a vortex gas that sweeps around the emitter spray tip to desolvate and to focus the Taylor cone into the MS inlet capillary. The vacuum seal to the MS ion guide draws all of the sample ions into the MS increasing the efficiency of sample transfer from the spray tip into the mass spectrometer. The direct connection to the inlet capillary eliminates the need for any source adjustment making the CaptiveSpray source truly Plug-and-Play. R Longuespee, M Fleron, C Pottier, F Quesada-Calvo, Marie-Alice Meuwis, et al. Currently, sampling methods, biochemical procedures, and MS instrumentations allow scientists to perform ‘‘in depth’’ analysis of the protein content of any type of tissue of interest. This article reviews the salient issues in proteomics analysis of tissues. We first outline technical and analytical considerations for sampling and biochemical processing of tissues and subsequently the instrumental possibilities for proteomics analysis such as shotgun proteomics in an anatomical context. Specific attention concerns formalin fixed and paraffin embedded (FFPE) tissues that are potential ‘‘gold mines’’ for histopathological investigations. In all, the matrix assisted laser desorption/ionization (MALDI) MS imaging, which allows for differential mapping of hundreds of compounds on a tissue section, is currently the most striking evidence of linkage and transition between ‘‘classical’’ and ‘‘molecular’’ histology. Tissue proteomics represents a veritable field of research and investment activity for modern biomarker discovery and development for the next decade. N Santana-Codina, R Carretero, R Sanz-Pamplona1, T Cabrera, et al. Bone metastasis is the most common distant relapse in breast cancer. The identification of key proteins involved in the osteotropic phenotype would represent a major step toward the development of new prognostic markers and therapeutic improvements. The aim of this study was to characterize functional phenotypes that favor bone metastasis in human breast cancer. We used the human breast cancer cell line MDA-MB-231 and its osteotropic BO2 subclone to identify crucial proteins in bone metastatic growth. We identified 31 proteins, 15 underexpressed and 16 overexpressed, in BO2 cells compared to parental cells. We employed a network-modeling approach in which these 31 candidate proteins were prioritized with respect to their potential in metastasis formation, based on the topology of the protein–protein interaction network and differential expression. The protein–protein interaction network provided a framework to study the functional relationships between biological molecules by attributing functions to genes whose functions had not been characterized. The combination of expression profiles and protein interactions revealed an endoplasmic reticulum-thiol oxidoreductase, ERp57, functioning as a hub which retained 4 downregulated nodes involved in antigen presentation associated with the human major histocompatibility complex class I molecules, including HLA-A, HLA-B, HLA-E and HLA-F. Further analysis of the interaction network revealed an inverse correlation between ERp57 and vimentin, which influences cytoskeleton reorganization. Moreover, knockdown of ERp57 in BO2 cells confirmed its bone organ-specific prometastatic role. Altogether, ERp57 appears as a multifunctional chaperone that can regulate diverse biological processes to maintain the homeostasis of breast cancer cells and promote the development of bone metastasis. Tandem-repeat protein domains, composed of repeated units of conserved stretches of 20–40 amino acids, are required for a wide array of biological functions. Despite their diverse and fundamental functions, there has been no comprehensive assessment of their taxonomic distribution, incidence, and associations with organismal lifestyle and phylogeny. In this study, we assess for the first time the abundance of armadillo (ARM) and tetratricopeptide (TPR) repeat domains across all three domains in the tree of life and compare the results to our previous analysis on ankyrin (ANK) repeat domains in this journal. All eukaryotes and a majority of the bacterial and archaeal genomes analyzed have a minimum of one TPR and ARM repeat. In eukaryotes, the fraction of ARM-containing proteins is approximately double that of TPR and ANK-containing proteins, whereas bacteria and archaea are enriched in TPR-containing proteins relative to ARM- and ANK-containing proteins. We show in bacteria that phylogenetic history, rather than lifestyle or pathogenicity, is a predictor of TPR repeat domain abundance, while neither phylogenetic history nor lifestyle predicts ARM repeat domain abundance. Surprisingly, pathogenic bacteria were not enriched in TPR-containing proteins, which have been associated within virulence factors in certain species. Taken together, this comparative analysis provides a newly appreciated view of the prevalence and diversity of multiple types of tandem-repeat protein domains across the tree of life. A central finding of this analysis is that tandem repeat domain-containing proteins are prevalent not just in eukaryotes, but also in bacterial and archaeal species. Anne-Kristin Fentz, Monika Sporl, Jorg Spangenberg, Heinz Joachim List, et al. Colorectal cancer is the second leading cause of cancer death, and it develops from benign colorectal adenomas in over 95% of patients. Early detection of these cancer precursors by screening tests and their removal can potentially eradicate more than 95% of colorectal cancers before they develop. To discover sensitive and specific biomarkers for improvement of pre-clinical diagnosis of colorectal adenoma and cancer, we analysed in two independent studies (n = 87 and n = 83 patients) serum samples from colorectal cancer (stage III), colorectal adenoma and control patients using SELDI-TOF-MS. Extensive statistical analysis was performed to establish homogeneous patient groups based on their clinical data. Two biomarkers that were each able to distinguish control patients from either colorectal adenoma or colorectal cancer patients (p,0.001) were identified as transthyretin (pre-albumin) and C3adesArg by MS/MS and were further validated by antibody-based assays (radial immunodiffusion, ELISA). A combination of both proteins clearly indicated the presence of colorectal adenoma or carcinoma. Using a cut-off of >0.225 g/L for transthyretin and >1974 ng/mL for C3a-desArg, we found a sensitivity and specificity for colorectal adenoma of 96% and 70%, respectively. The endoplasmic reticulum (ER) stress response is a cytoprotective mechanism that maintains homeostasis of the ER by upregulating the capacity of the ER in accordance with cellular demands. If the ER stress response cannot function correctly, because of reasons such as aging, genetic mutation or environmental stress, unfolded proteins accumulate in the ER and cause ER stress-induced apoptosis, resulting in the onset of folding diseases, including Alzheimer’s disease and diabetes mellitus. Although the mechanism of the ER stress response has been analyzed extensively by biochemists, cell biologists and molecular biologists, many aspects remain to be elucidated. For example, it is unclear how sensor molecules detect ER stress, or how cells choose the two opposite cell fates (survival or apoptosis) during the ER stress response. To resolve these critical issues, structural and computational approaches will be indispensable, although the mechanism of the ER stress response is complicated and difficult to understand holistically at a glance. Here, we provide a concise introduction to the mammalian ER stress response for structural and computational biologists. Thomas A Hopf, Charlotta P I Schärfe, João P G L M Rodrigues, et al. Protein–protein interactions are fundamental to many biological processes. Experimental screens have identified tens of thousands of interactions, and structural biology has provided detailed functional insight for select 3D protein complexes. An alternative rich source of information about protein interactions is the evolutionary sequence record. Building on earlier work, we show that analysis of correlated evolutionary sequence changes across proteins identifies residues that are close in space with sufficient accuracy to determine the three-dimensional structure of the protein complexes. We evaluate prediction performance in blinded tests on 76 complexes of known 3D structure, predict protein–protein contacts in 32 complexes of unknown structure, and demonstrate how evolutionary couplings can be used to distinguish between interacting and non-interacting protein pairs in a large complex. With the current growth of sequences, we expect that the method can be generalized to genome-wide elucidation of protein–protein interaction networks and used for interaction predictions at residue resolution. Jorge Alegre-Cebollada, P Kosuri, D Giganti, E Eckels, JA Rivas-Pardo, et al. The giant elastic protein titin is a determinant factor in how much blood fills the left ventricle during diastole and thus in the etiology of heart disease. Titin has been identified as a target of S-glutathionylation, an end product of the nitric-oxide-signaling cascade that increases cardiac muscle elasticity. However, it is unknown how S-glutathionylation may regulate the elasticity of titin and cardiac tissue. Here, we show that mechanical unfolding of titin immunoglobulin (Ig) domains exposes buried cysteine residues, which then can be S-glutathionylated. S-glutathionylation of cryptic cysteines greatly decreases the mechanical stability of the parent Ig domain as well as its ability to fold. Both effects favor a more extensible state of titin. Furthermore, we demonstrate that S-glutathionylation of cryptic cysteines in titin mediates mechanochemical modulation of the elasticity of human cardiomyocytes. We propose that posttranslational modification of cryptic residues is a general mechanism to regulate tissue elasticity. Dima Kozakov, Keyong Li, David R Hall, Dmitri Beglov, Jiefu Zheng, et al. An outstanding challenge has been to understand the mechanism whereby proteins associate. We report here the results of exhaustively sampling the conformational space in protein–protein association using a physics-based energy function. The agreement between experimental intermolecular paramagnetic relaxation enhancement (PRE) data and the PRE profiles calculated from the docked structures shows that the method captures both specific and non-specific encounter complexes. To explore the energy landscape in the vicinity of the native structure, the nonlinear manifold describing the relative orientation of two solid bodies is projected onto a Euclidean space in which the shape of low energy regions is studied by principal component analysis. Results show that the energy surface is canyon-like, with a smooth funnel within a two dimensional subspace capturing over 75% of the total motion. Thus, proteins tend to associate along preferred pathways, similar to sliding of a protein along DNA in the process of protein-DNA recognition. The development of proteomics is a timely one for cardiovascular research. Analyses at the organ, subcellular, and molecular levels have revealed dynamic, complex, and subtle intracellular processes associated with heart and vascular disease. The power and flexibility of proteomic analyses, which facilitate protein separation, identification, and characterization, should hasten our understanding of these processes at the protein level. Properly applied, proteomics provides researchers with cellular protein “inventories” at specific moments in time, making it ideal for documenting protein modification due to a particular disease, condition, or treatment. This is accomplished through the establishment of species- and tissue-specific protein databases, providing a foundation for subsequent proteomic studies. Evolution of proteomic techniques has permitted more thorough investigation into molecular mechanisms underlying cardiovascular disease, facilitating identification not only of modified proteins but also of the nature of their modification. Continued development should lead to functional proteomic studies, in which identification of protein modification, in conjunction with functional data from established biochemical and physiological methods, has the ability to further our understanding of the interplay between proteome change and cardiovascular disease. Systematic studies of the cancer genome have generated a wealth of knowledge in recent years. These studies have uncovered a number of new cancer genes not previously known to be causal targets in cancer. Genetic markers can be used to determine predisposition to tumor development, but molecularly targeted treatment strategies are not widely available for most cancers. Precision care plans still must be developed by understanding and implementing basic science research into clinical treatment. Proteomics is continuing to make major strides in the discovery of fundamental biological processes as well as more recent transition into an assay platform capable of measuring hundreds of proteins in any biological system. As such, proteomics can translate basic science discoveries into the clinical practice of precision medicine. The proteomic field has progressed at a fast rate over the past five years in technology, breadth and depth of applications in all areas of the bioscience. Some of the previously experimental technical approaches are considered the gold standard today, and the community is now trying to come to terms with the volume and complexity of the data generated. Here I describe contribution of proteomics in general and biological mass spectrometry in particular to cancer research, as well as related major technical and conceptual developments in the field. Nicholas M Chesarino, Jocelyn C Hach, James L Chen, Balyn W Zaro, et al. Background: Palmitoylation is a 16-carbon lipid post-translational modification that increases protein hydrophobicity. This form of protein fatty acylation is emerging as a critical regulatory modification for multiple aspects of cellular interactions and signaling. Despite recent advances in the development of chemical tools for the rapid identification and visualization of palmitoylated proteins, the palmitoyl proteome has not been fully defined. Here we sought to identify and compare the palmitoylated proteins in murine fibroblasts and dendritic cells. Results: A total of 563 putative palmitoylation substrates were identified, more than 200 of which have not been previously suggested to be palmitoylated in past proteomic studies. Here we validate the palmitoylation of several new proteins including Toll-like receptors (TLRs) 2, 5 and 10, CD80, CD86, and NEDD4. Palmitoylation of TLR2, which was uniquely identified in dendritic cells, was mapped to a transmembrane domain-proximal cysteine. Inhibition of TLR2 S-palmitoylation pharmacologically or by cysteine mutagenesis led to decreased cell surface expression and a decreased inflammatory response to microbial ligands. Conclusions: This work identifies many fatty acylated proteins involved in fundamental cellular processes as well as cell type-specific functions, highlighting the value of examining the palmitoyl proteomes of multiple cell types. Spalmitoylation of TLR2 is a previously unknown immunoregulatory mechanism that represents an entirely novel avenue for modulation of TLR2 inflammatory activity. Long-chain fatty acid possesses myriad roles in the biological function of the cells, not only as an energy substrate but also as substrates for cell membrane synthesis and as precursors for intracellular signaling molecules. However, little is known about the biological pathways that are stimulated by long-chain fatty acid. In order to identify the pathway of long-chain fatty acid, we performed 2-dimensional gel electrophoresis in the cells treated with or without oleate, and then analyzed 648 protein spots using PDQuest software and narrowed down 22 significant changing spots by statistical criterion. We also tried to determine these spots by MALDI-QIT-TOF-MS and SWISSPROT database query. We identified 11 proteins and predicted the biological network using available data sets from protein-protein interaction database. This prediction indicated that several protein kinase Cs (PKCs) underlie long chain fatty acid signaling. Indeed, oleate stimulated predicted PKC pathways. In expression array, oleate significantly up-regulated only PKC epsilon, but not other PKCs, in transcriptional levels. Collectively, our proteomics and network analysis implicates that PKC epsilon pathway plays an important role in long-chain fatty acid signaling. Over the years, the difficulties of transferring fundamental proteomics discoveries to clinical applications have caused a lot of frustration to proteomics researchers and clinicians alike, in both academia and industry. One of the reasons for this barrier is the lack of understanding between basic scientists and physicians: they have been trained using opposing concepts. Whilst the former want to control and understand all variables, the latter need rapid actions on patients, rather than absolute certainties. Both disciplines are difficult to con-dense into a single scientist and therefore interdisciplinary associations need to be fostered. Translational research has often been viewed as a two-way street: bedside to bench, and back to bedside. We should perhaps look at it as a roundabout, with the patient and his disease in the center, surrounded by a constant, iterative inter-play between basic, translational and clinical scientists, from both the public and private sectors. Proteomics research needs more than just a translation road bridge from discoveries to cures. Rather, it requires networks of road junctions to fill all the gaps and to allow cross-fertilization and synergies. Translational research and translational proteomics are more than just interesting concepts and hot keywords, they are supposed to improve the quality of people’s lives. With the launch of Translational Proteomics, we want to help the scientific and medical communities overcome the challenges on the long path from discovery to patient care. By focusing on connecting basic proteomics research to its ultimate clinical applications, the Journal will provide a space for publications detailing proteomics experiments, from early discovery to validation and the bedside. Ankyrin adaptors together with their spectrin partners coordinate diverse ion channels and cell adhesion molecules within plasma membrane domains and thereby promote physiological activities including fast signaling in the heart and nervous system. Ankyrins specifically bind to numerous membrane targets through their 24 ankyrin repeats (ANK repeats), although the mechanism for the facile and independent evolution of these interactions has not been resolved. Here we report the structures of ANK repeats in complex with an inhibitory segment from the C-terminal regulatory domain and with a sodium channel Nav1.2 peptide, respectively, showing that the extended, extremely conserved inner groove spanning the entire ANK repeat solenoid contains multiple target binding sites capable of accommodating target protein with very diverse sequences via combinatorial usage of these sites. These structures establish a framework for understanding the evolution of ankyrins’ membrane targets, with implications for other proteins containing extended ANK repeat domains. Asymmetric segregation of damaged proteins at cell division generates a cell that retains damage and a clean cell that supports population survival. In cells that divide asymmetrically, such as Saccharomyces cerevisiae, segregation of damaged proteins is achieved by retention and active transport. We have previously shown that in the symmetrically dividing Schizosaccharomyces pombe there is a transition between symmetric and asymmetric segregation of damaged proteins. Yet how this transition and generation of damage-free cells are achieved remained unknown. Here, by combining in vivo imaging of Hsp104-associated aggregates, a form of damage, with mathematical modeling, we find that fusion of protein aggregates facilitates asymmetric segregation. Our model predicts that, after stress, the increased number of aggregates fuse into a single large unit, which is inherited asymmetrically by one daughter cell, whereas the other one is born clean. We experimentally confirmed that fusion increases segregation asymmetry, for a range of stresses, and identified Hsp16 as a fusion factor. Our work shows that fusion of protein aggregates promotes the formation of damage-free cells. Fusion of cellular factors may represent a general mechanism for their asymmetric segregation at division. How can the integrin adhesome get self-assembled locally, rapidly, and correctly as diverse cell-matrix adhesion sites? Here, we investigate this question by exploring the cytosolic state of integrin-adhesome components and their dynamic exchange between adhesion sites and cytosol. Using fluorescence cross-correlation spectroscopy (FCCS) and fluorescence recovery after photo-bleaching (FRAP) we found that the integrin adhesome is extensively pre-assembled already in the cytosol as multi-protein building blocks for adhesion sites. Stationary focal adhesions release symmetrically the same types of protein complexes that they recruit, thereby keeping the cytosolic pool of building blocks spatiotemporally uniform. We conclude a model in which multi-protein building blocks enable rapid and modular self-assembly of adhesion sites and symmetric exchange of these building blocks preserves their specifications and thus the assembly logic of the system. Oxidative protein folding in the endoplasmic reticulum (ER) has emerged as a potentially significant source of cellular reactive oxygen species (ROS). Recent studies suggest that levels of ROS generated as a byproduct of oxidative folding rival those produced by mitochondrial respiration. Mechanisms that protect cells against oxidant accumulation within the ER have begun to be elucidated yet many questions still remain regarding how cells prevent oxidant-induced damage from ER folding events. Here we report a new role for a central well-characterized player in ER homeostasis as a direct sensor of ER redox imbalance. Specifically we show that a conserved cysteine in the lumenal chaperone BiP is susceptible to oxidation by peroxide, and we demonstrate that oxidation of this conserved cysteine disrupts BiP’s ATPase cycle. We propose that alteration of BiP activity upon oxidation helps cells cope with disruption to oxidative folding within the ER during oxidative stress. Cells are linked together dynamically by adhesion molecules, such as the classical cadherins. E-cadherin, which mediates epithelial cell–cell interactions, plays fundamental roles in tissue organization and is often perturbed in diseases such as cancer. It has long been recognized that the biology of E-cadherin arises from cooperation between adhesion and the actin cytoskeleton. 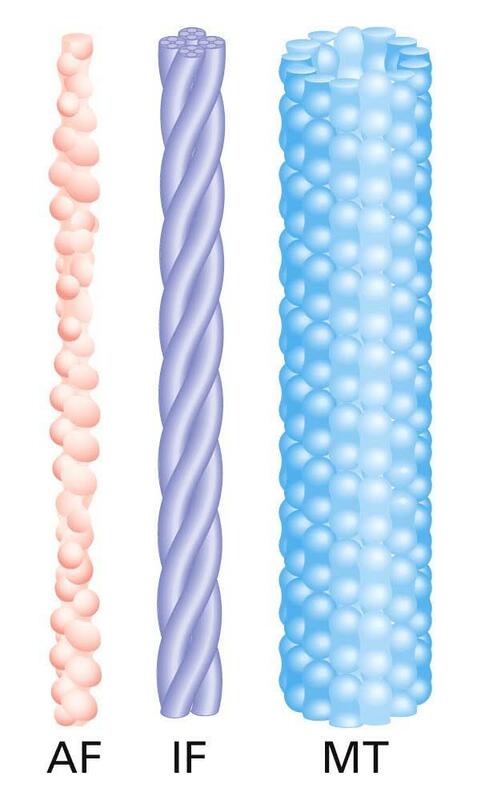 A major feature is the generation of contractile forces at junctions, yielding patterns of tension that contribute to tissue integrity and patterning. Here we discuss recent developments in understanding how cadherin junctions integrate signaling and cytoskeletal dynamics to sense and generate force. N-glycosylation of E-cadherin has been shown to inhibit cell–cell adhesion. Specifically, our recent studies have provided evidence that the reduction of E-cadherin N-glycosylation promoted the recruitment of stabilizing components, vinculin and serine/threonine protein phosphatase 2A (PP2A), to adherens junctions (AJs) and enhanced the association of AJs with the actin cytoskeleton. Here, we examined the details of how N-glycosylation of E-cadherin affected the molecular organization of AJs and their cytoskeletal interactions. Using the hypoglycosylated E-cadherin variant, V13, we show that V13/β-catenin complexes preferentially interacted with PP2A and with the microtubule motor protein dynein. This correlated with dephosphorylation of the microtubule-associated protein tau, suggesting that increased association of PP2A with V13-containing AJs promoted their tethering to microtubules. On the other hand, V13/γ-catenin complexes associated more with vinculin, suggesting that they mediated the interaction of AJs with the actin cytoskeleton. N-glycosylation driven changes in the molecular organization of AJs were physiologically significant because transfection of V13 into A253 cancer cells, lacking both mature AJs and tight junctions (TJs), promoted the formation of stable AJs and enhanced the function of TJs to a greater extent than wild-type E-cadherin. These studies provide the first mechanistic insights into how N-glycosylation of E-cadherin drives changes in AJ composition through the assembly of distinct β-catenin- and γ-catenin-containing scaffolds that impact the interaction with different cytoskeletal components. Force transduction at cell-cell adhesions regulates tissue development, maintenance and adaptation. We developed computational and experimental approaches to quantify, with both subcellular and multi-cellular resolution, the dynamics of force transmission in cell clusters. Applying this technology to spontaneously-forming adherent epithelial cell clusters, we found that basal force fluctuations were coupled to E-cadherin localization at the level of individual cell-cell junctions. At the multi-cellular scale, cell-cell force exchange depended on the cell position within a cluster, and was adaptive to reconfigurations due to cell divisions or positional rearrangements. Importantly, force transmission through a cell required coordinated modulation of cell-matrix adhesion and actomyosin contractility in the cell and its neighbors. These data provide insights into mechanisms that could control mechanical stress homeostasis in dynamic epithelial tissues, and highlight our methods as a resource for the study of mechanotransduction in cell-cell adhesions. Homotypic or entotic cell-in-cell invasion is an integrin-independent process observed in carcinoma cells exposed during conditions of low adhesion such as in exudates of malignant disease. Although active cell-in-cell invasion depends on RhoA and actin, the precise mechanism as well as the underlying actin structures and assembly factors driving the process are unknown. Furthermore, whether specific cell surface receptors trigger entotic invasion in a signal-dependent fashion has not been investigated. In this study, we identify the G-protein-coupled LPA receptor 2 (LPAR2) as a signal transducer specifically required for the actively invading cell during entosis. We find that G12/13 and PDZ-RhoGEF are required for entotic invasion, which is driven by blebbing and a uropod-like actin structure at the rear of the invading cell. Finally, we provide evidence for an involvement of the RhoA-regulated formin Dia1 for entosis downstream of LPAR2. Thus, we delineate a signaling process that regulates actin dynamics during cell-in-cell invasion. The heart is a force-generating organ that responds to self-generated electrical stimuli from specialized cardiomyocytes. This function is modulated by sympathetic and parasympathetic activity. 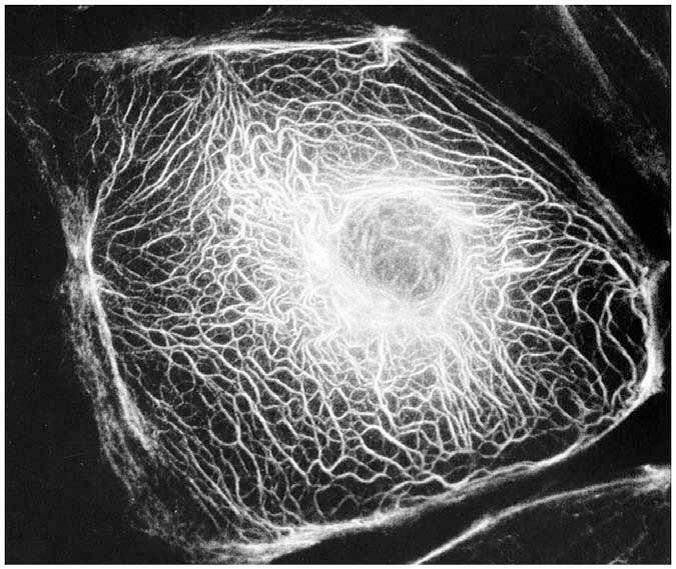 In order to contract and accommodate the repetitive morphological changes induced by the cardiac cycle, cardiomyocytes depend on their highly evolved and specialized cytoskeletal apparatus. 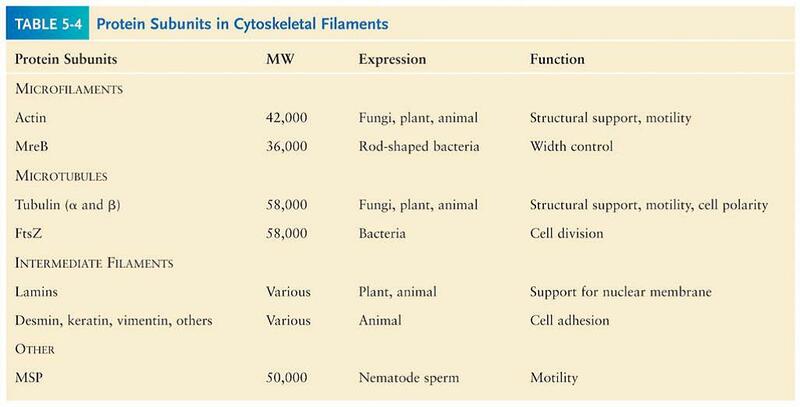 Defects in components of the cytoskeleton, in the long term, affect the ability of the cell to compensate at both functional and structural levels. In addition to the structural remodeling, the myocardium becomes increasingly susceptible to altered electrical activity leading to arrhythmogenesis. The development of arrhythmias secondary to structural remodeling defects has been noted, although the detailed molecular mechanisms are still elusive. Here I will review the current knowledge of the molecular and functional relationships between the cytoskeleton and ion channels and, I will discuss the future impact of new data on molecular cardiology research and clinical practice. Sodium/proton antiporters are essential for sodium and pH homeostasis and play a major role in human health and disease. We determined the structures of the archaeal sodium/proton antiporter MjNhaP1 in two complementary states. The inward-open state was obtained by x-ray crystallography in the presence of sodium at pH8, where the transporter is highly active. The outward-open state was obtained by electron crystallography without sodium at pH4, where MjNhaP1 is inactive. Comparison of both structures reveals a 7° tilt of the 6-helix bundle. Na+ uptake measurements indicate non-cooperative transport with an activity maximum at pH7.5. We conclude that binding of a Na+ ion from the outside induces helix movements that close the extracellular cavity, open the cytoplasmic funnel, and result in a ~5 Å vertical relocation of the ion binding site to release the substrate ion into the cytoplasm. After endocytosis, membrane proteins can recycle to the cell membrane or be degraded in lysosomes. Cargo ubiquitylation favors their lysosomal targeting and can be regulated by external signals, but the mechanism is ill-defined. Here, we studied the post-endocytic trafficking of Jen1, a yeast monocarboxylate transporter, using microfluidics-assisted live cell imaging. We show that the ubiquitin ligase Rsp5 and the glucose-regulated arrestin related (ART) protein Rod1, involved in the glucose-induced internalization of Jen1, are also required for the post-endocytic sorting of Jen1 to the yeast lysosome. This new step takes place at the trans-Golgi network (TGN), where Rod1 localizes dynamically upon triggering endocytosis. Indeed, transporter trafficking to the TGN after internalization is required for their degradation. Glucose removal promotes Rod1 relocalization to the cytosol and Jen1 deubiquitylation, allowing transporter recycling when the signal is only transient. Therefore, nutrient availability regulates transporter fate through the localization of the ART/Rsp5 ubiquitylation complex at the TGN. Cytoplasmic dynein is a molecular motor that transports a large variety of cargoes (e.g., organelles, mRNAs, and viruses) along microtubules over long intracellular distances. The dynactin protein complex is important for dynein activity in vivo, but its precise role has been unclear. Here, we found that purified mammalian dynein did not move processively on microtubules in vitro. However, when dynein formed a complex with dynactin and one of four different cargo-specific adapter proteins, the motor became ultra-processive, moving for distances similar to those of native cargoes in living cells. Thus, we propose that dynein is largely inactive in the cytoplasm and that a variety of adapter proteins activate processive motility by linking dynactin to dynein only when the motor is bound to its proper cargo. The contribution of solvent-exposed charged residues to protein stability was evaluated using ubiquitin as a model protein. We combined site-directed mutagenesis and specific chemical modifications to first replace all Arg residues with Lys, followed by carbomylation of Lys- amino groups. Under the conditions in which all carboxylic groups are protonated (at pH 2), the chemically modified protein is folded and very stable (dG= 18 kJ/mol). These results indicate that surface charge–charge interactions are not an essential fundamental force for protein folding and stability. Clustering of proteins into micrometer-sized structures at membranes is observed in many signaling pathways. Most models of clustering are specific to particular systems, and relationships between physical properties of the clusters and their molecular components are not well understood. We report biochemical reconstitution on supported lipid bilayers of protein clusters containing the adhesion receptor Nephrin, and its cytoplasmic partners, Nck and N-WASP. With Nephrin attached to the bilayer, multivalent interactions enable these proteins to polymerize on the membrane surface and undergo two-dimensional phase separation, producing micrometer-sized clusters. Dynamics and thermodynamics of the clusters are modulated by the valencies and affinities of the interacting species. In the presence of the Arp2/3 complex, the clusters assemble actin filaments, suggesting that clustering of regulatory factors could promote local actin assembly at membranes. Interactions between multivalent proteins could be a general mechanism for cytoplasmic adaptor proteins to organize membrane receptors into micrometer-scale signaling zones. Dani L Bodor, João F Mata, Mikhail Sergeev, Ana Filipa David, et al. The centromere, responsible for chromosome segregation during mitosis, is epigenetically defined by CENP-A containing chromatin. The amount of centromeric CENP-A has direct implications for both the architecture and epigenetic inheritance of centromeres. Using complementary strategies, we determined that typical human centromeres contain ∼400 molecules of CENP-A, which is controlled by a mass-action mechanism. This number, despite representing only ∼4% of all centromeric nucleosomes, forms a ∼50-fold enrichment to the overall genome. In addition, although pre-assembled CENP-A is randomly segregated during cell division, this amount of CENP-A is sufficient to prevent stochastic loss of centromere function and identity. Finally, we produced a statistical map of CENP-A occupancy at a human neocentromere and identified nucleosome positions that feature CENP-A in a majority of cells. In summary, we present a quantitative view of the centromere that provides a mechanistic framework for both robust epigenetic inheritance of centromeres and the paucity of neocentromere formation. The molecular underpinnings of synaptic vesicle fusion for fast neurotransmitter release are still unclear. Here, we used a single vesicle–vesicle system with reconstituted SNARE and synaptotagmin-1 proteoliposomes to decipher the temporal sequence of membrane states upon Ca2+-injection at 250–500 μM on a 100-ms timescale. Furthermore, detailed membrane morphologies were imaged with cryo-electron microscopy before and after Ca2+-injection. We discovered a heterogeneous network of immediate and delayed fusion pathways. Remarkably, all instances of Ca2+-triggered immediate fusion started from a membrane–membrane point-contact and proceeded to complete fusion without discernible hemifusion intermediates. In contrast, pathways that involved a stable hemifusion diaphragm only resulted in fusion after many seconds, if at all. When complexin was included, the Ca2+-triggered fusion network shifted towards the immediate pathway, effectively synchronizing fusion, especially at lower Ca2+-concentration. Synaptic proteins may have evolved to select this immediate pathway out of a heterogeneous network of possible membrane fusion pathways. Far from being inert, the vascular endothelium is a critical regulator of vascular function. While the endothelium participates in autocrine, paracrine, and endocrine signaling, it also transduces mechanical signals from the cell surface involving key cell structural elements. In this review, we discuss the structure of the vascular endothelium and its relationship to traditional cardiovascular risk factors and clinical cardiovascular events. Further, we review the emerging evidence that cell structural elements, including the glycocalyx, intercellular junctions, and cytoskeleton elements, help the endothelium to communicate with its environment to regulate vascular function, including vessel permeability and signal transduction via nitric oxide bioavailability. Further work is necessary to better delineate the regulatory relationships between known key regulators of vascular function and endothelial cell structural elements. Aurélie Alleaume-Butaux, C Dakowski, M Pietri, S Mouillet-Richard, et al. Neuritogenesis is a dynamic phenomenon associated with neuronal differentiation that allows a rather spherical neuronal stem cell to develop dendrites and axon, a prerequisite for the integration and transmission of signals. The acquisition of neuronal polarity occurs in three steps: (1) neurite sprouting, which consists of the formation of buds emerging from the postmitotic neuronal soma; (2) neurite outgrowth, which represents the conversion of buds into neurites, their elongation and evolution into axon or dendrites; and (3) the stability and plasticity of neuronal polarity. 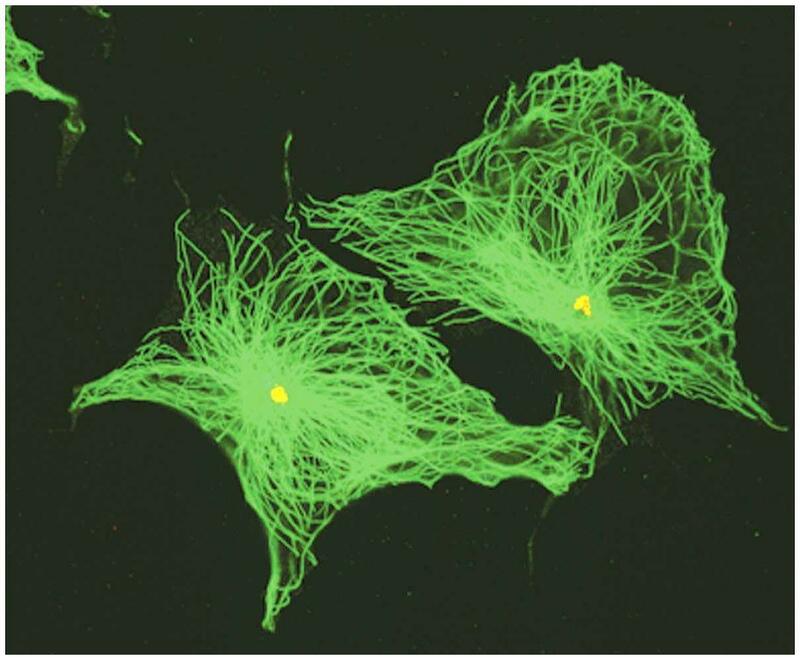 In neuronal stem cells, remodeling and activation of focal adhesions (FAs) associated with deep modifications of the actin cytoskeleton is a prerequisite for neurite sprouting and subsequent neurite outgrowth. A multiple set of growth factors and interactors located in the extracellular matrix and the plasma membrane orchestrate neuritogenesis by acting on intracellular signaling effectors, notably small G proteins such as RhoA, Rac, and Cdc42, which are involved in actin turnover and the dynamics of FAs. The cellular prion protein (PrPC), a glycosylphosphatidylinositol (GPI)-anchored membrane protein mainly known for its role in a group of fatal neurodegenerative diseases, has emerged as a central player in neuritogenesis. Here, we review the contribution of PrPC to neuronal polarization and detail the current knowledge on the signaling pathways fine-tuned by PrPC to promote neurite sprouting, outgrowth, and maintenance. We emphasize that PrPC-dependent neurite sprouting is a process in which PrPC governs the dynamics of FAs and the actin cytoskeleton via β1 integrin signaling. The presence of PrPC is necessary to render neuronal stem cells competent to respond to neuronal inducers and to develop neurites. In differentiating neurons, PrPC exerts a facilitator role towards neurite elongation. This function relies on the interaction of PrPC with a set of diverse partners such as elements of the extracellular matrix, plasma membrane receptors, adhesion molecules, and soluble factors that control actin cytoskeleton turnover through Rho-GTPase signaling. Once neurons have reached their terminal stage of differentiation and acquired their polarized morphology, PrPC also takes part in the maintenance of neurites. By acting on tissue nonspecific alkaline phosphatase, or matrix metalloproteinase type 9, PrPC stabilizes interactions between neurites and the extracellular matrix. 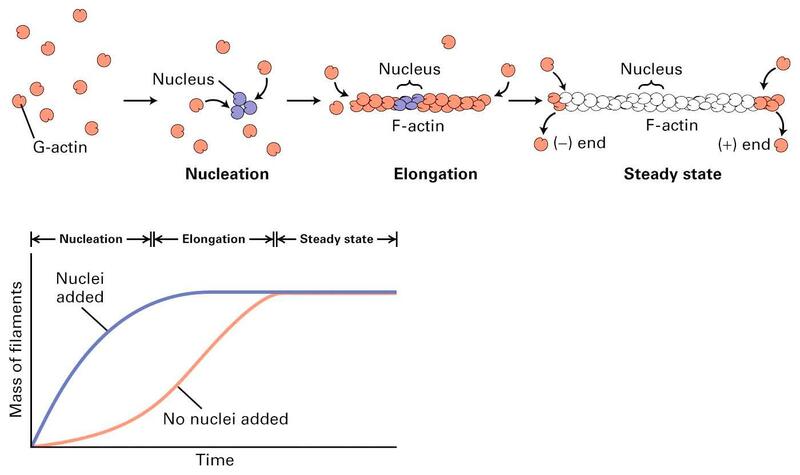 Microtubule acetylation is a key posttranslational modification that enhances organelle transport, drives cell signaling, and regulates cell cycle regulation. The optimal level of microtubule acetylation is regulated by the acetyltransferase alpha-tubulin-N-acetyltransferase 1and two deacetylases, histone deacetylase 6 and sirtuin-2. Alterations in microtubule acetylation levels have been associated with the pathophysiology of a number of diseases, including various forms of neurodegenerative conditions, cancer, and even cystic fibrosis. In this review, we will highlight the biological and clinical significance of microtubule acetylation and the potential of targeting this pathway for therapeutics. Deak, S. Blass, M. J. Khan, L. N. Groschner, M. Waldeck-Weiermair, et al. Mitochondria contribute to cell signaling by controlling store-operated Ca2+ entry (SOCE). SOCE is activated by Ca2+ release from the endoplasmic reticulum (ER), whereupon the stromal interacting molecule 1 (STIM1) forms oligomers, redistributes to ER-plasma membrane junctions, and opens plasma membrane Ca2+ channels. Mechanisms by which mitochondria interfere with the complex process of SOCE are insufficiently clarified. In this study we used a shRNA approach to investigate the direct involvement of mitochondrial Ca2+ buffering in SOCE. We demonstrate that knock-down of two proteins that are essential for mitochondrial Ca2+ uptake, either the mitochondrial calcium uniporter (MCU) or uncoupling protein 2 (UCP2), results in decelerated STIM1 oligomerization and impaired SOCE following cell stimulation with an inositol-1,4,5-trisphosphate (IP3)-generating agonist. Upon artificially augmented cytosolic Ca2+-buffering or ER Ca2+ depletion by sarco/endoplasmic reticulum Ca2+-ATPase (SERCA) inhibitors, STIM1 oligomerization did not rely on intact mitochondrial Ca2+ uptake. However, MCU-dependent mitochondrial sequestration of Ca2+ entering through the SOCE pathway was essential to prevent slow deactivation of SOCE. Our findings show a stimulus specific contribution of mitochondrial Ca2+ uptake to the SOCE machinery likely by shaping cytosolic Ca2+ micro-domains. Aging is associated with increased adiposity and diminished thermogenesis, but the critical transcription factors influencing these metabolic changes late in life are poorly understood. We recently demonstrated that the winged helix factor forkhead box protein A3 (Foxa3) regulates the expansion of visceral adipose tissue in high-fat diet regimens; however, whether Foxa3 also contributes to the increase in adiposity and the decrease in brown fat activity observed during the normal aging process is currently unknown. Here we report that during aging, levels of Foxa3 are significantlyand selectively up-regulated in brown and inguinal white fat depots, and that midage Foxa3-null mice have increased white fat browning and thermogenic capacity, decreased adipose tissue expansion, improved insulin sensitivity, and increased longevity. Foxa3 gain-of-function and loss-of-function studies in inguinal adipose depots demonstrated a cell-autonomous function for Foxa3 in white fat tissue browning. Furthermore, our analysis revealed that the mechanisms of Foxa3 modulation of brown fat gene programs involve the suppression of peroxisome proliferator activated receptor γ coactivtor 1 α (PGC1α) levels through interference with cAMP responsive element binding protein 1-mediated transcriptional regulation of the PGC1α promoter. Overall, our data demonstrate a role for Foxa3 in energy expenditure and in age-associated metabolic disorders. Jordi Espadaler, Narayanan Eswa, Enrique Querol, Francesc X Avilés, et al. Background: A number of studies have used protein interaction data alone for protein function prediction. Here, we introduce a computational approach for annotation of enzymes, based on the observation that similar protein sequences are more likely to perform the same function if they share similar interacting partners. Results: The method has been tested against the PSI-BLAST program using a set of 3,890 protein sequences from which interaction data was available. For protein sequences that align with at least 40% sequence identity to a known enzyme, the specificity of our method in predicting the first three EC digits increased from 80% to 90% at 80% coverage when compared to PSI-BLAST. Conclusion: Our method can also be used in proteins for which homologous sequences with known interacting partners can be detected. Thus, our method could increase 10% the specificity of genome-wide enzyme predictions based on sequence matching by PSI-BLAST alone. Whatever the nutritional status and the disease condition, the actual transthyretin (TTR) plasma level is determined by opposing influences between anabolic and catabolic alterations. Rising TTR values indicate that synthetic processes prevail over tissue breakdown with a nitrogen balance (NB) turning positive as a result of efficient nutritional support and / or anti-inflammatory therapy. Declining TTR values point to the failure of sustaining NB as an effect of maladjusted dietetic management and / or further worsening of the morbid condition. Serial measurement of TTR thus appears as a dynamic index defining the direction of NB in acute and chronic disorders, serving as a guide to alert the physician on the validity of his therapeutic strategy. The level of TTR production by the liver also works as a limiting factor for the cellular bioavailability of retinol and retinoid derivatives which play major roles in the brain ageing process. Optimal protein nutritional status, as assessed by TTR values within the normal range, prevents the occurrence of vascular and cerebral damages while maintaining the retinoid-mediated memory, cognitive and behavioral activities of elderly persons. Reiner, A., Heldt, S.A., Presley, C.S., (…), Gurley, S.N., Moore, B.M. findings recommend further evaluation of CB2 inverse agonists as a novel therapeutic approach for treating mild TBI. Tillgren, V., Ho, J.C.S., Önnerfjord, P., Kalamajski, S.
The constitution and biophysical properties of extracellular matrices can dramatically influence cellular phenotype during development, homeostasis, or pathogenesis. These effects can be signaled through a differentially regulated assembly of collagen fibrils, orchestrated by a family of collagen-associated small leucine-rich proteins (SLRPs). In this report, we describe the tissue-specific expression and function of a previously uncharacterized SLRP, chondroadherin-like (CHADL). We developed antibodies against CHADL and, by immunohistochemistry, detected CHADL expression mainly in skeletal tissues, particularly in fetal cartilage and in the pericellular space of adult chondrocytes. In situ hybridizations and immunoblots on tissue lysates confirmed this tissue-specific expression pattern. Recombinant CHADL bound collagen in cell culture and inhibited in vitro collagen fibrillogenesis. After Chadl shRNA knockdown, chondrogenic ATDC5 cells increased their differentiation, indicated by increased transcript levels of Sox9, Ihh, Col2a1, and Col10a1. The knockdown increased collagen II and aggrecan deposition in the cell layers. Microarray analysis of the knockdown samples suggested collagen receptor-related changes, although other upstream effects could not be excluded. Together, our data indicate that the novel SLRP CHADL is expressed in cartilaginous tissues, influences collagen fibrillogenesis, and modulates chondrocyte differentiation. CHADL appears to have a negative regulatory role, possibly ensuring the formation of a stable extracellular matrix. Zhang, H., Chi, Y., Gao, K., Zhang, X., Yao, J. Growth arrest is one of the essential features of cellular senescence. At present, the precise mechanisms responsible for the establishment of the senescence-associated arrested phenotype are still incompletely understood. Given that ERK1/2 is one of the major kinases controlling cell growth and proliferation, we examined the possible implication of ERK1/2. Exposure of normal rat epithelial cells to etoposide caused cellular senescence, as manifested by enlarged cell size, a flattened cell body, reduced cell proliferation, enhanced ?-galactosidase activity, and elevated p53 and p21. Senescent cells displayed a blunted response to growth factor-induced cell proliferation, which was preceded by impaired ERK1/2 activation. Further analysis revealed that senescent cells expressed a significantly higher level of mitogenactivated protein phosphatase 3 (MKP-3, a cytosolic ERK1/2-targeted phosphatase), which was suppressed by blocking the transcriptional activity of the tumor suppressor p53 with pifithrin-?. Inhibition of MKP-3 activity with a specific inhibitor or siRNA enhanced basal ERK1/2 phosphorylation and promoted cell proliferation. Apart from its role in growth arrest, impairment of ERK1/2 also contributed to the resistance of senescent cells to oxidant-elicited cell injury. These results therefore indicate that p53-mediated up-regulation of MKP-3 contributes to the establishment of the senescent cellular phenotype through dephosphorylating ERK1/2. Impairment of ERK1/2 activation could be an important mechanism by which p53 controls cellular senescence. Gandhi, H., Worch, R., Kurgonaite, K., (…), Bökel, C., Weidemann, T.
It has long been established that dimerization of Interleukin-4 receptor (IL-4R) subunits is a pivotal step for JAK/STAT signal transduction. However, ligand-induced complex formation at the surface of living cells has been challenging to observe. Here we report an experimental assay employing trisNTA dyes for orthogonal, external labeling of eGFP-tagged receptor constructs that allows the quantification of receptor heterodimerization by dual-color fluorescence cross-correlation spectroscopy. Fluorescence cross-correlation spectroscopy analysis at the plasma membrane shows that IL-4R subunit dimerization is indeed a strictly ligand-induced process. Under conditions of saturating cytokine occupancy, we determined intramembrane dissociation constants (Kd,2D) of 180 and 480 receptors per ?m2 for the type-2 complexes IL-4:IL-4R?/IL-13R?1 and IL-13:IL-13R?1/IL-4R?, respectively. For the lower affinity type-1 complex IL-4:IL-4R?/IL-2R?, we estimated a Kd,2D of ?1000 receptors per ?m2. The receptor densities required for effective dimerization thus exceed the typical, average expression levels by several orders of magnitude. In addition, we find that all three receptor subunits accumulate rapidly within a subpopulation of early sorting and recycling endosomes stably anchored just beneath the plasma membrane (cortical endosomes, CEs). The receptors, as well as labeled IL-4 and trisNTA ligands are specifically trafficked into CEs by a constitutive internalization mechanism. This may compensate for the inherent weak affinities that govern ligand-induced receptor dimerization at the plasma membrane. Consistently, activated receptors are also concentrated at the CEs. Our observations thus suggest that receptor trafficking may play an important role for the regulation of IL-4R-mediated JAK/STAT signaling. Nonalcoholic fatty liver disease (NAFLD) affects about 30% of the general population in the United States and includes a spectrum of disease that includes simple steatosis, non-alcoholic steatohepatitis (NASH), fibrosis and cirrhosis. Significant insight has been gained into our understanding of the pathogenesis of NALFD; however the key metabolic aberrations underlying lipid accumulation in hepatocytes and the progression of NAFLD remain to be elucidated. Accumulating and emerging evidence indicate that hepatic mitochondria play a critical role in the development and pathogenesis of steatosis and NAFLD. Here, we review studies that document a link between the pathogenesis of NAFLD and hepatic mitochondrial dysfunction with particular focus on new insights into the role of impaired fatty acid oxidation, the transcription factor peroxisome proliferator-activated receptor-? coactivator-1? (PGC-1? ), and sirtuins in development and progression of NAFLD.